Hughton reminisces on being a Hammer. | NUFC Blog. Hughton reminisces on being a Hammer. 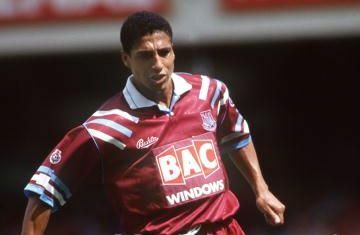 On the verge of Newcastle United’s clash with the jellied eel munchers of West Ham, manager and east end boy, Chris Hughton, has been reminiscing on his days as a West Ham player. Hughton was born in Forest Gate, East London, which is deep in West Ham country, and attended St Bonaventure’s school in the area, which was also attended by Jermain Defoe. Like Defoe, Hughton’s playing career is undoubtedly most closely associated with North London’s Tottenham Hotspur, though Hughton did spend over a year playing for his hometown club at the beginning of the ‘nineties. “I’ve still got a lot of friends there. “I wasn’t there for that long a period – just over a year. I was there 90/91 – I went at Christmas and played through the rest of that season. “We got promotion and got to the semi-finals of the FA Cup. “That was the semi-final where Tony Gale got sent off, and we lost to Nottingham Forest. They played Spurs in what people will remember as the Gazza final. “There are similarities between the supporters. “They’re very much a working-class support – the sort who will support their team through thick and thin. It should also be a very evenly balanced game at Upton Park / The Boleyn Ground tomorrow. For Toonsy’s excellent preview of the match, click here. Blinking ‘eck. So he’s been at Spurs, West Ham and Newcastle. Has he ever actually won owt? (In the top division). “Blinking ‘eck. So he’s been at Spurs, West Ham and Newcastle. Two FA Cups and a UEFA Cup with Tottenham, DJG. When was that? As a player? Im guessing FA cup was as coach was it. Those were the major trophies he won as a player, DJG. The FA Cups were in 1981 and 1982, and the UEFA Cup was in 1984. Oh, did Spurs not win the FA cup more recently or am I thinking about the wrong club? Erm, FA Cup winners 1991, League Cup winners 1999 and 2008, DJG. They also won the Charity Shield and were runners up in the League Cup a couple of times (2002 and 2009). BAC Windows? Divven’t knaa, Icedog. I’m good on football, but I’m shite on window companies! Pompey about to close down, anyone think we should get a couple of players Beladj or someone like that?? Portsmouth going out of budiness! Big wake up call for football. Icedog. I looked it up for you. They merged with a company called “SEH” to become “SEHBAC” apparently. I think thats probably a load of bollox butI’d rather have JK back than Pardew, he’s hopeless. Wow, what horrible rumors about CH & Jose. Must be the work of some Magpie hater, maybe one of Carroll’s ex-girlfriends or purchases. None of my coaches would put us through any drills the day before a game that could lead to injury. Basically you walk through the strategies and do some penalty kick and/or throw in practice. If a coach grinds his players 7 days a week, he will not win many and not long be employed. So if Ponpey shut down, what happens to the Championship standings? Is there an automatic promotion, games wiped out, or what? Hughton has done nowt but good for the club. Can we not show a decent bloke a bit of loyalty, If Shepherd hadnt taken Bobbys authority by announcing his forthcoming departure we wouldnt be here and nor would we if we hadnt pushed Roeder after an injury ruined season in which we reached the latter stages in europe and the league cup and finished midtable. Any other club would have given him another season, Like Everton did with Moyes after they finished 4th bottom and look how thats worked out. are pompey really going out of business? Of course it is, CC. Toonsy,apparently a deal was sorted then the former owner moved the goal posts on payment of money he was owed at the last minute, I reckon he’ll move them back again tho. CC… I’d take it all with a pinch of salt,they were wrong about loads over the summer and most of the stuff they were right about I’d already heard or read elsewhere.They deal in rumours nowt more, law of probability says they have to be right occasionally. jay jay….is that ye off to work? later mate. jay jay…ya’ll have to go in the home end at Bolton then mate. jay jay did ya see that they’re getting nae extra tickets for Bolton? Well home end it is then, don’t you start batty I’ll do you nee bother. completely off topic, but does anyone know how much ticket prices are for the newcastle arsneal cup match for a 16 year old? Not for the first time I disagree with Andy Grey. If we put our absolute strongest side out compared to Hammers strongest side, on paper I would say we had a better team or at the very least not much in it. The trouble id when do we ever have our strongest team available. These rumors about hughton getting the boot are rubbish , the guy is on a low wage and replacing him would mean Ashley forking out more money because no other manager would take the job for the money that Hoots is on . Sacking him would cause unrest in the camp and Ashley knows what happened last time he went down that road and the simple truth is financially he won’t take that risk again . If we are in the bottom 3 after xmas then that might change though . MA and the board have learned their lessons I believe. They won’t rush into drastic decisions. They will wait to see where we are around Christmas time if Hughton is to be replaced. Although, I think there’s a possibility, however small, that if he’s replaced he still might stick around as a coach. Lord knows we need plenty of those at the moment. I really hope that Jose Enrique is not injured, as the Bull is pretty vital for us right now. However, I would have complete faith in Kadar OR Ferguson taking his place if injured. I much prefer that to seeing Perch or Simpson thrown out there when they’re already suspect in their natural positions! On the subject of our right backs, I fear that we may be seeing Perch start yet again tomorrow after reading some of Hughton’s comments in the last couple days between being unsure if Danny Simpson is ready to start a PL match and also saying that we have a lot of players who are still adjusting to the Premier League and need more time. Ugh, this is terrible. How long was Ryan Taylor a regular right back for Wigan? Hughton is always looking for players with the right experience, right? Raylor must just not get along with Hughton or something. I realize that I’m putting all this up when everybody’s already asleep, but its not even 10:00 yet over here in Florida. Looking forward to watching the game tomorrow on TV!! Hoping for a win today-just can’t see it myself. Alreet Batty-hope all is well. sjt aye m8 it is ,hows you? Does anyone think this low wage Hoots is on, (not by normal people standards by the way), might be a stumbling block to finding a decent assistant and Ashley might have to give him a new contract already. Which I doubt he would want to do as he could be sharpening his axe for Jan if results are poor. DJG…thats why I thought it might be Campbell as the cheap option but we need experience and preferably an attacker imo. not saying nowt aboot score today not falling into the toonsy trap! Why doesn’t C.H give R.Taylor a game at RW. I know he wants to play RB but unlike Guthrie I think he could actually do a decent job there and certainly he can do more than just set plays. This defending wouldn’t matter so much and although not as pacy, I think he would just also be Beckham like in delivering before being challenged and big Andy would have more to feed off than Routledge surely. Aye richietoon, are you going to the match today? Also with the height we’ve now got up for set plays it seems rediculous not having a dead ball player in the side. No mate Bolton’s my next away game and probably last away game before Xmas. Avram Grant has warned West Ham may have to start getting nasty with referees if they continue to pay the price for being a soft touch. The Hammers have been on the wrong end of a string of bad decisions so far this season, the most recent being a disallowed Frederic Picquionne goal that cost them victory at Wolves last weekend. Grant is convinced that teams who are “aggressive” towards match officials end up earning an advantage. And he admitted the bottom-of-the-table Hammers will have to consider a Jekyll and Hyde personality switch if things do not start improving soon. “Everybody needs to be aware that teams who don’t behave sportingly and always go to the referee have an advantage over teams that behave nicely,” Grant said. “Last week it cost us two points and because there are so many decisions against us I start to think that because we are nice the other team has an advantage. “I don’t want to think it is because my players behave well and they don’t jump on the referees and we on the bench are very sporting – but it is affecting us. “It is not in my way to say ‘Scott Parker, next time slide-tackle the referee’ – but I will think about this if I see it continue. but it seems CH doesn’t visit this website at all. The lad played on both wings for Wigan in dosens of prem league match ffs. It’s not like he’s never played there. Al good Batty Cheers Fella-Back upto the toon in 8 days for my birthday-looking forward to it big time.